This large swath of susti is a perfect layer to add just the right dash of gypsy wild to any outfit, or the finishing panache on your already fabulous ensemble! The tassels are individually crafted and tied, the epitome of ethnic chic! It's angelic and bridal in white, all-season fashion in black, and a dash of color flair in every shade in-between. 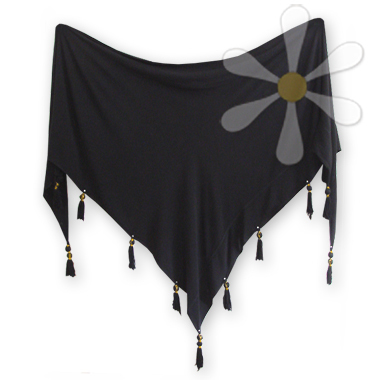 Wrap up your hair, your neck, your shoulders, or use it as a hip scarf (fabulous for belly dancers! ); drape it over one shoulder, tied at the waist; twist and knot into a dozen scarf styles... be creative, express yourself!